Summary: Extension agents servicing St Lucie and Indian River Counties will work with local environmental education centers, public libraries and other public outreach organizations to disseminate educational materials and maintain educational displays designed to teach the public Sea Turtle Friendly practices. Recommended practices that will be featured include reducing the effects of artificial lights, removal/relocation of beach furniture at night, protecting/re-establishing sand dunes, cleaning up marine debris, proper pet beach etiquette, etc. 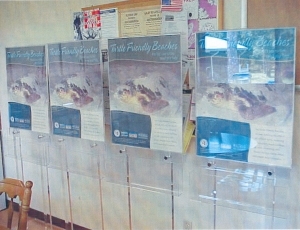 These materials and displays will be utilized at heavily trafficked public facilities throughout both counties. Educational materials produced for this project will include a hand-out describing Sea Turtle Friendly practices in addition to an educational brochure about sea turtle biology and their nesting habitat. Posters and displays will be created and rotated to different public facilities throughout St Lucie and Indian River Counties.